Retail properties are some of the most varied and versatile commercial real estate assets. While technology and the Internet have presented some challenges for retail, many CRE owners know the value of a well-run and vital retail property. Despite recent challenges, many lenders are still bullish on retail. In the first of a series of CRE property types, we’ll take a quick glance at the retail property type and how lenders look at the asset. Retail properties range from single-tenant buildings to small strip centers with no anchor, to large shopping malls with multiple anchors. Retail properties can also include outparcels, where a part of the land is designated for individual tenants such as fast food chains, banks, or other standalone retailers. 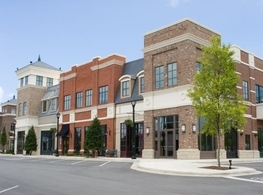 Retail properties that have multiple tenants are categorized by size and type of tenants. The International Council of Shopping Centers (ICSC) designates these multi-tenant properties into several categories. Malls: These large retail properties (400,000 – 1,000,000+ square feet) are the most recognizable retail properties and are going through the most change. Malls can either be open air or enclosed, with large department store chains and mass merchants as their anchor. Once a fixture of nearly every American community, malls are now in transition. Rather than strictly shopping emporiums, malls are now focusing more on leisure and entertainment – experiences that cannot be adequately satisfied online. The trade area size – the range where retail properties get 75% of their customers – is from five to 25 miles. Malls can be tricky propositions for most lenders and they will look at the vitality of the overall area, the approach to the customer experience, and the strength of the anchor tenant. Community and Neighborhood Centers: Community centers range from 125,000 – 400,000 square feet. Oftentimes, these centers are anchored by a big box retailer, supermarket or drug chain. These centers might range in size from 30,000 to 400,000 square feet. The trade area for community centers is from three to six miles. Neighborhood centers are a smaller version of community centers (30,000 – 125,000 square feet) and represent approximately 30% of all ICSC classified shopping centers. They are most often anchored by a grocery store and have a trade area of around three miles. Newer centers with long-term leases are the most desirable. Strip / Convenience: Also called “strip centers” these properties are usually an attached row of stores or services with parking located in front of the stores. These properties generally feature convenience tenants such as dry cleaners, nail salons or mini marts. Strip centers are smaller than 30,000 square feet and have a trade area of less than one mile. These properties can be difficult for lenders to underwrite since the tenants are usually local businesses. The immediate area surrounding the strip center, quality of the structure, and strength of the businesses are considerations for lenders. Power Centers: These large centers feature “big box” retailers, category-dominant anchors, home improvement chains, wholesale clubs and discount department stores with only a few small tenants. These properties often contain pads or spaces in the parking areas and have a trade area of five to 10 miles. Lenders prefer national credit tenant anchors, proximity to residential areas and freeway accessibility. Lifestyle Centers: These newer, upscale centers usually feature national chains and upscale dining in an outdoor setting with a trade area from eight to 12 miles. A lender will look at the leases, the quality of the tenants and whether the center’s approach matches its community’s demographics. Diversity of tenants across many industries can insulate asset from a downturn in the market or a shift in customer buying habits, for example, the move to online purchasing. By having multiple tenants within one retail center with staggered lease expirations, the property will have continual cash flow when there is turnover or a change in tenancy. Retail has begun to change over time due to the “Amazon” effect that is forcing brick and mortar retailers to compete with online shopping. Many retailers have downsized into smaller footprint stores and found ways to compete by also selling their products online. Many that haven’t taken these steps have closed their doors. In many cases property owners have subdivided the big boxes into smaller, more efficient spaces. Whereas there is no denying the significance of e-commerce on brick-and-mortar retail, there will always be a place for retail. Many shoppers still want to touch and feel merchandise, see the merchandise in-person and ask questions rather than doing everything online. Consumers also enjoy the convenience and gratification of buying something in a store instead of paying for shipping and waiting days for delivery. Amazon, for example, is establishing it’s own brick-and-mortar properties across the country, validating the idea that in-store shopping is still a great way for shoppers to discover products. Aside from strong historical financials, lenders like to see retail properties with long-term leases -- preferably NNN (net, net, net -- these pass-through expenses of leasing are the portions tenants or lessees pay in addition to the rent to the landlord or lessor. The NNN fees are property taxes, property insurance and common area maintenance) with established national credit tenants. While national tenants are attractive to lenders, they will also consider local tenants if a borrower can show consistent income, although perhaps at lower leverage or with recourse to reduce the risk. Lenders will also take into account the lease expirations within the specified loan term to determine what tenants have the possibility of vacating and what exposure the lender may have in case the property is foreclosed on. Depending on who the lender is they may want to reserve money for tenant improvements and leasing commissions to retenant the space when a tenant vacates, which can be taken from cash flow. There are many ways a lender can structure around potential issues that may arise during the loan term that can directly affect a Borrower’s decision when choosing a lender. What property type you invest in and manage largely depends on your individual objectives and strategy. Always do your homework on the financing implications of your decision. Rates and lenders change so do your financing research early. Talk to Plum to find out what kind of financing is available for your property, and how to position it for the best rate and terms.